Anyway, here are the pictorial answers to the tag questions. Birthplace: Dallas, Texas - home of the Texas State Fair and BIG TEX!!! 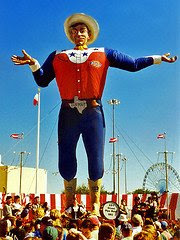 Really fun memories of Big Tex saying "El-e-men-ta-ry da-y" when he was announcing who all was invited to the fair that day! Favorite Vacation Destination:Brugges, Belgium. I love chocolate and lace, and they have it ALL! 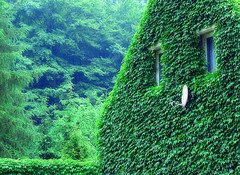 (this is a picture of "The Lake of Love") Awwww! Dream career: Teacher - does this prove I'm a real dweeb? I just love helping kids learn stuff. 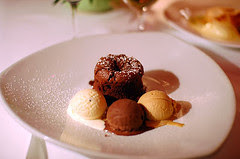 Guilty pleasure: Chocolate cake and ice cream. Y-U-M!!! 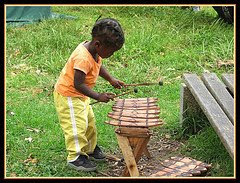 Favorite hobby: Playing my marimba. I even played Uncle Alan a four-verse version of 'happy birthday' as his birthday present on Sunday. WAY FUN! 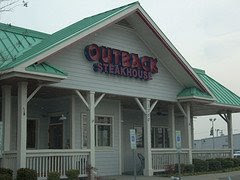 Favorite Restaurant: Outback Steakhouse. Probably another 'dweeby' choice, but I still like it. Any place where the manager will come out and fall in love with my granddaughter and carry her all over the restaurant has my business! 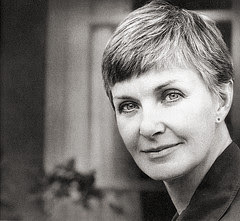 Favorite Actress: Joanne Woodward. 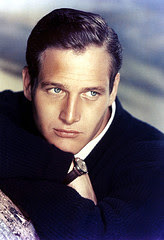 She has the stuff it takes not only to be a good actress, but to keep a man like Paul Newman married to her for all these years! You go, girl! 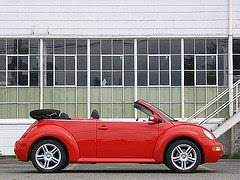 Favorite vehicle: When I was home from college for the summer once I got to drive a convertible red Volkswagen! It wasn't good to drive it if there was a chance of rain, though - the top wouldn't come up! I got caught at work once when it started to rain, and the girls helped me wrap the entire car in plastic wrap to keep it dry! Ha! 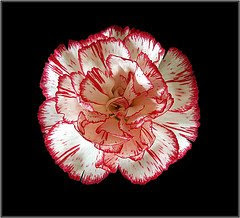 Favorite Flower: The humble, versatile and long-lasting carnation. It comes in so many colors, and lasts for weeks! A real hard-working, budget-minded flower! I love things like that! Best Friend? Taffy loved me unconditionally.But Mom comes a close second. Cake or Pie? Sometimes cake but mostly pie.....or maybe cake....at least it needs to have ice cream. Day of Choice? Friday nights two ball with Marilyn Cecile Roan Griffitts/Saturday for football, Final round Sundays after church for the four majors/ Monday Pro-ams/Thursday is Stag day...Sunday is Church....so any day. Favorite Color? Blue for the sky/Green for the trees/Red for Mom's forehead when she's mad at me. Gummy Bears or Worms? I don't get this question, mwhy would you use Gummy Bears for fishing?...Plus I don't fish.. Hometown? Born in Pasadena, California/ Live in Hayden Lake , Idaho. Slept throughpout the US and Western Europe. 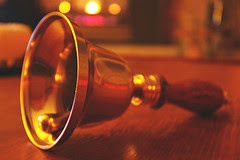 Indulgences? Jamoca Almond Fudge Ice Cream with frozen M&Ms and Milk in Ice cream.. Kids? 7 of them Heather, Tamar,Bud, Trevor, Lindsay, Riley, Darbye ( if the question was Kids or Grandkids....Well, What do you think? Phobias/Fears? Running out of Money, Snakes, Scorpions, Gila Monsters.....and Shanking the Golf Ball. Quotes? I love Mom..I'm sorry I said that Taffy was the one who unconditionally loved me...I love Mom...I love Mom...I love Mom...For my health I love Mom. My other quote is "Far better it is dare mighty deeds though overcome by failure than to take rank with those poor timid souls that know neither victory nor defeat". Reason to Smile? Waking up next to Mom...Seriously.. 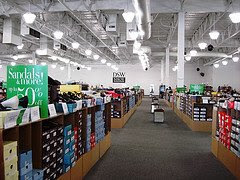 Season? Well probably pepper more than salt, but I like other types of seasons as well..Like golf, football, summer without humidity, the fall in Texas...and golf..
Tag Six? 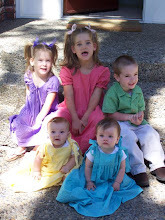 My brother Alan and five wonderful grandchildren.....Emma, Payson, Abby, Ashlyn and Ava.. Unknown fact about me? I used to love being in musicals when I was 12-15. Church usually. Vegetarian or Oppressor of Animals(Obedient to the Word of Wisdom)? Duh.. I am obedient. Worst Habit? I have many bad ones so it's hard to really identify one more that another..Probably too much humility. X-Rays or Ultrasounds? I have had X-Rays so that's my answer..